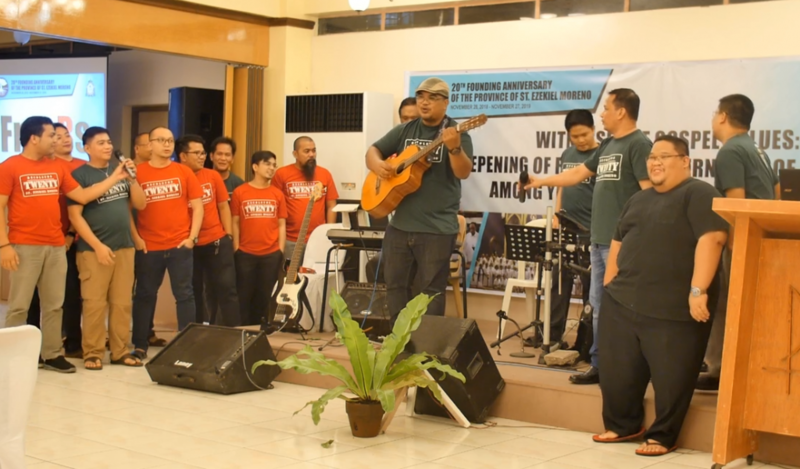 Mira Nila, QUEZON CITY – If the evening program of November 27, the first day of the 20th founding anniversary celebrations of the St. Ezekiel Moreno Province, were to be likened to a galaxy, the eldest group among the friars who, by unanimous estimation, stole the show would be the brightest of stars. Although last in the queue to present themselves, the most “kuya” in the Province, which in that evening was collectively called the Venerables, was actually a merging of the “Sunset Group” and “Newed Recollects.” These last two names, by chronological order starting from the eldest group, were among those conventionally created in 1997 when the erstwhile Vicariate of the Philippines and China was preparing for its Provincehood. Next to them were the “Bisagra” (or “Hinges”) because they composed the last of batches to spend their novitiate and theologate in Spain. 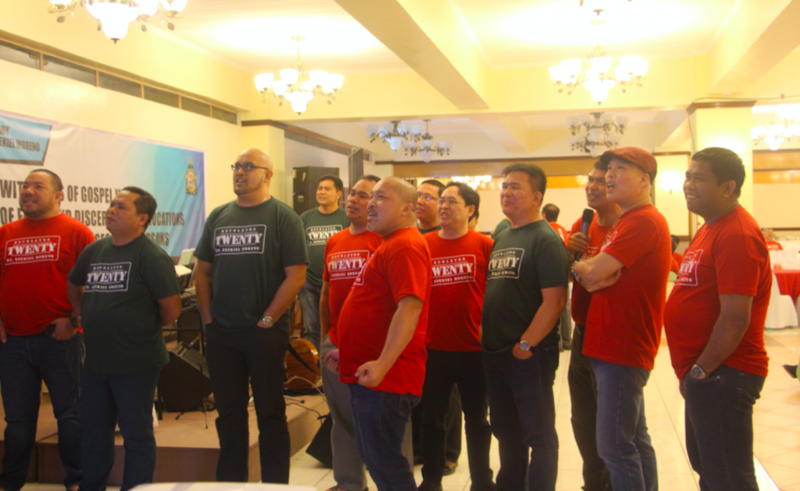 The cluster called the “Venerables.” (Standing from L-R) Fray Leonardo Pauligue, Fray Lauro Larlar, Fray Samson Silloriquez, Fray René Paglinawan, Fray Ceferino Roberto Añez, Fray and Regino Bangcaya. (Seated from L-R) Fray Emilio Larlar, Jr., Fray Walthrode Conde, Fray Emeterio Buñao, Fray Dunstan Huberto Decena, and Fray Federico Gregorio. The Venerables’ stellar prominence that evening at the Bulwagang Recoletos Atrium did not come, however, from any gravity-defying performance nor any magical execution of sort. In fact, while just serenely and smilingly facing their younger confreres, those “senior citizens” by civil category—half of them seated, the other half standing—offered Gospel-based exhortations and spiritual roadmaps to chart for the ensuing decades, related some broad historical sketches of the Filipinization movement or enlightening tidbits about the genesis of the Province, or shared their experiences as Augustinian Recollect religious. Fray Walthrode Conde, the eldest in the Province at age 83, recalled with clarity those Filipinos who became Recollects since 1950s. He was trying to link the present to the not-so-distant past when Frays Oscar de la Rosa, Faustino Paglinawan, and Cirilo Durana—the first two made their simple profession in 1952, while the third in 1953—were together ordained priests in1959. Fray Walthrode Conde, the eldest in the Province at age 83, shared with his younger brothers his insights and gratitude for the graces that the Province received in the past 20 years. 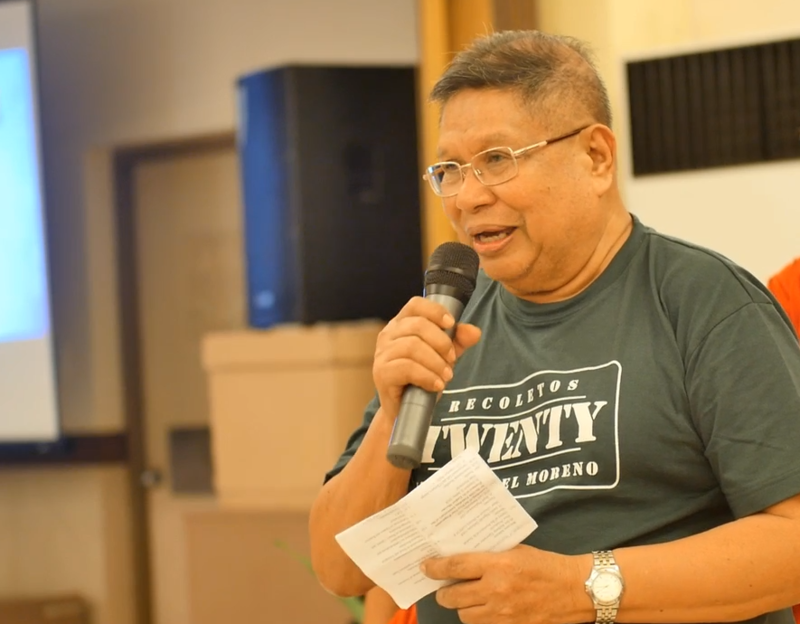 Fray Emeterio Buñao, for his part, refreshed the younger ones about the five ordinances directly related to the establishment of the Province of St. Ezekiel Moreno, the eighth and youngest Province until the reconfiguration of the Order into four Provinces during the General Chapter of 2016. 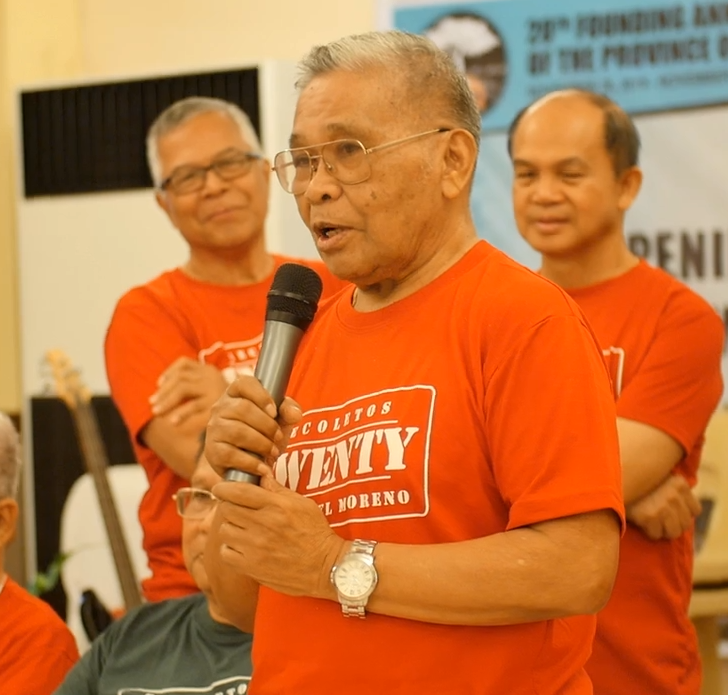 Fray Emeterio Buñao (center) reminisced the events of the 52nd General Chaper in 1998 held at Monachil, Granada, Spain that gave birth to the Province of St. Ezekiel Moreno. At his back were Fray Lauro Larlar (left), former Prior Provincial, and Fray Samsom Silloriquez (right) former General Councilor. Those five ordinances approved on that unforgettable 28th day of November 1998 by the 52nd General Chapter held at the Monastery of Our Lady of Good Counsel in Monachil, Granada, Spain dealt with: the creation of a new province, its patronage, territories, membership, and patrimony. 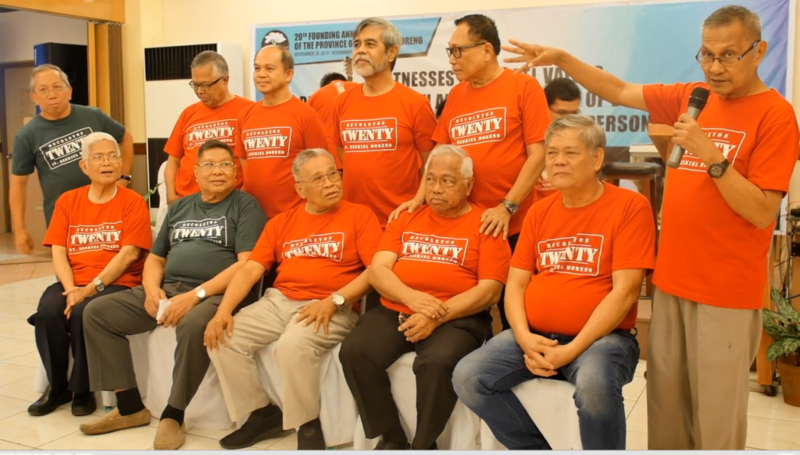 In this group, moreover, belongs the first three elected Priors Provincial of the Province: Fray Emeterio Buñao (1999-2003), Fray Lauro Larlar (2003-2006, 2006-2009), and Fray Regino Bangcaya (2009-2012). Fray Larlar was re-elected to the office for the second time during the triennium 2012-2015. 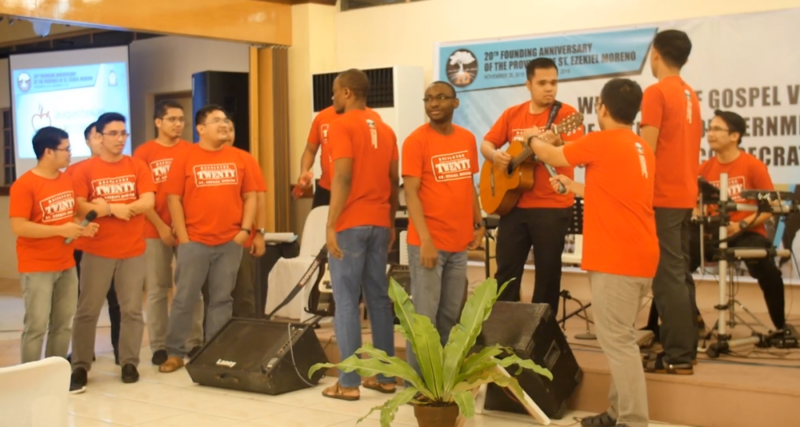 Clad in their anniversary T-shirts in red or dark sacramento, the friars assembled at the Bulwagang Recoletos Atrium for the 6:00 P.M. praying of the vespers (evening prayers). 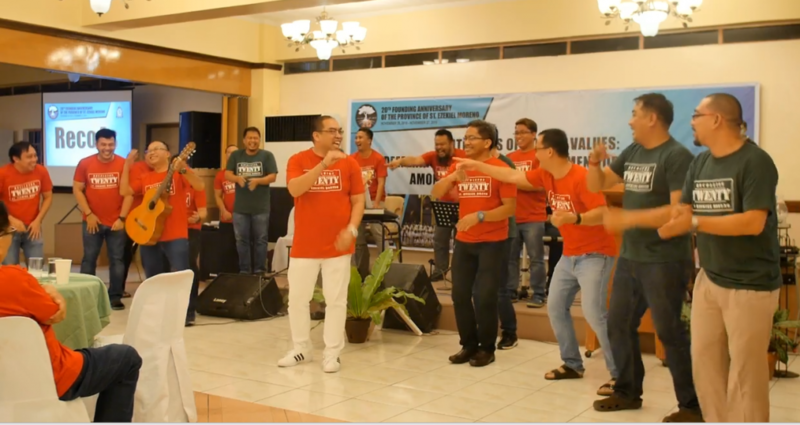 Transitioning to the first part of the program, the prayerful mood continued as the brothers sang Josh Groban’s version of “You raise me up,” with Fray Giovanni Gil Magbojos, OAR, on the keyboard. Fray Hubert Dunstan Decena led the opening prayer. Fray Lauro Larlar, former Prior Provincial and current prior of Recoletos de Mira-Nila welcomed the brothers in his opening remarks. In saying this, Fray Larlar was putting in context the birth, life and mission of the Province within the circumference of Vatican II and the OAR General Chapters of 2004, 2010 and 2016. After these appetizers for the soul, dinner was served. No doubt, the family ambience and social quotient during meals were enhanced as the coristas rendered familiar songs live onstage. The second part of the program opened with the community singing of “Ibigay ang puso mo” composed by a former Augustinian Recollect, Fr. Ferdinand Hernando, MB. The newly-ordained deacon, Fray Jorr Rabacal, willingly sat when called to be the piano accompanist. He mentioned about the soon-to-be officially established Recoletos de Plaridel community in Aborlan, Palawan. In this barangay stands the San Rafael Parish church which, as of this writing, belongs to the Recollect community of Inagawan in Puerto Princesa City in terms of apostolate area. Father Provincial also gave updates as regards our mission works in Saipan and Sierra Leone as well as the recent development in the plans of the archbishop of Pontianak for the two Recollect missionaries in Indonesia. 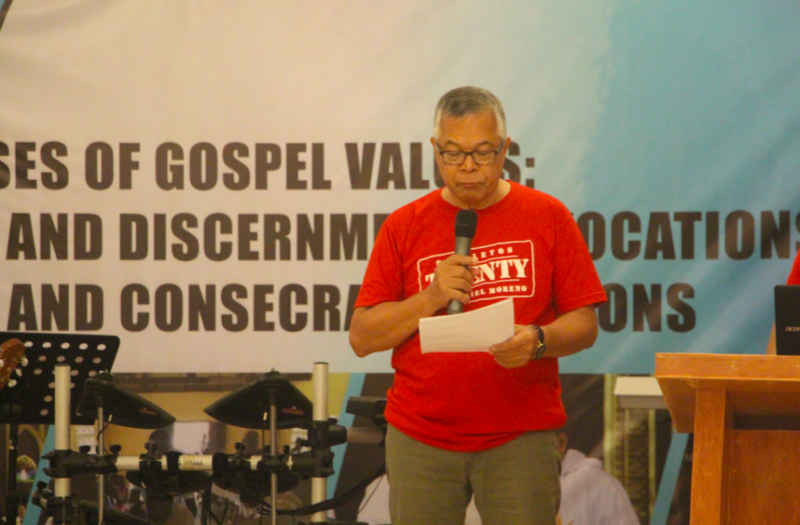 He also informed the brothers about the scheduled renewal visit of the Fray Miguel Miró—his last in his capacity as Prior General—from February to March 2019, and the meeting of the General Secretariat of Ministerial Apostolate in Cebu, also next year. Father Selma made a special mention of the Prior General’s “Protocol for Protecting Children and Young People in the Order of Augustinian Recollects” in accordance with Pope Francis’s 2015 directive. 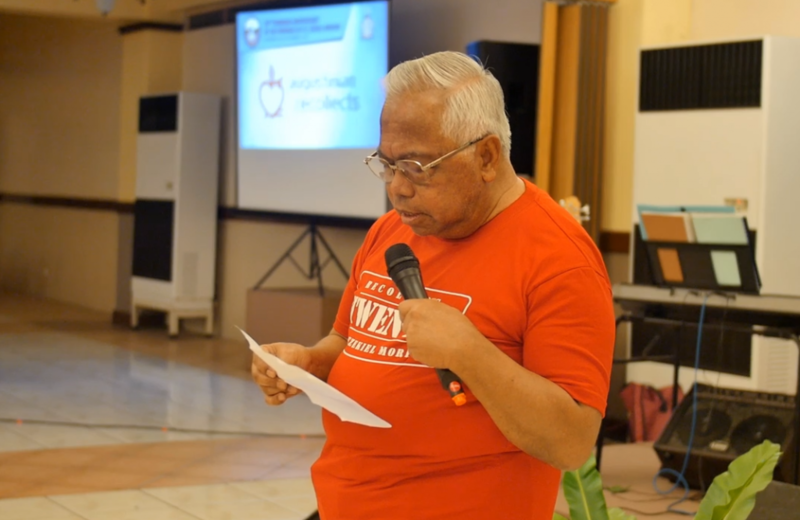 Using a powerpoint presentation, Father Selma highlighted the need to look back, to look around, to look forward and, most importantly, he said, “to look up.” He was referring to every religious’ and community’s non-negotiable connection with God. This, he further stressed by calling to mind the icon of the beloved disciple who was leaning on the chest of Jesus, a position and disposition of listening to the Author of our vocation and mission. Aware that some parts of his report would be dealt with more deeply during the following day’s “historical excavation,” he simply talked about those areas as a sort of review: the text of the Decreto de Erección of the Province; brief comparative statistical panorama of religious personnel, houses, and areas of apostolate; and the “cosas notables” in the Universal Church and the Order during the first and second decades (hence: 1998-2008 and 2008-2018, respectively) of the Province. 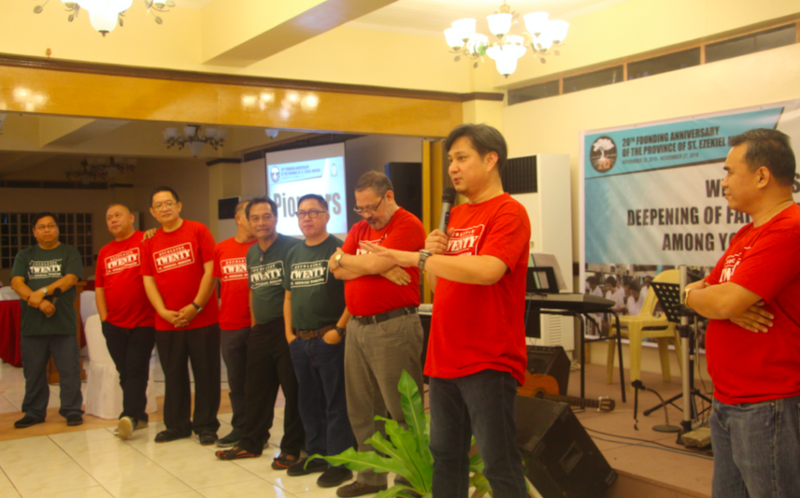 The Prior Provincial, Fray Dionisio Selma, addressed the brothers and answered some of their questions. Two religious raised their questions or interventions to the speaker. 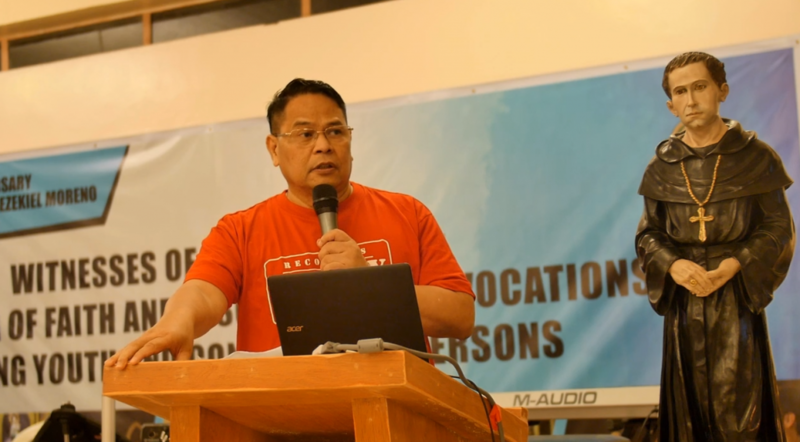 Fray Manuel Lipardo asked about the planned structural renovations for the Recoletos de Mira-Nila while Fray Hubert Decena made some clarifications about the plans behind the expedited construction of Recoletos Formation Center in early 1980s. The tandem of Frays Paul Demillones and Jovy Gallego as emcees of the evening program was great as they did their job quite well. Surely they did their homework of making some research. For instance, before proceeding with the batch presentation, they first announced the statistical update on the number of religious of the Province as published by the Office of the Provincial Secretary during the 100th day of the quadrennium. (And this is now the most recent: as of November 27, 2018, the St. Ezekiel Moreno Province has 179 religious all in all, with this breakdown: 142 are in Permanent Formation while 37 are in Initial Formation. Of the 142: 134 are clerical religious while 8 are Religious Brothers. Of the 37 coristas: 13 are deacons while 24 are simply professed.) Then, they hoisted a rhetorical question whether anyone knows the name or face of every religious in the Province. That was enough reason for the friars to introduce or re-introduce themselves or their cluster to the assembly. The novices were the first to present themselves, followed by the simply professed coristas, then the deacons. Most of them not only introduced themselves and their hometown, but also mentioned who among the friars were their “idol,” which naturally elicited cheers from some sectors in the crowd. “FrayRs” was formed when the Life and Mission Project of the Province in 2015-2018 gave instruction on the use of “Fray,” an equalizing title for all the professed Recollects whether clerical religious or Religious Brother. The “Rs” refers to the spirit of “Revitalization and Restructuring” that directs the entire Order. “Gen X” was the youngest group before the St. Ezekiel Moreno Province was born. It was “neXt” to the first batch of Recollects “entirely” produced in the Philippines. Although they belong to the category of GenerationX (i.e., 1960s to 1980s, following the Millennials or Generation Y), they consider themselves as the generation (=disciples) who follow Christ (indicated by the Greek character X or “chi”). 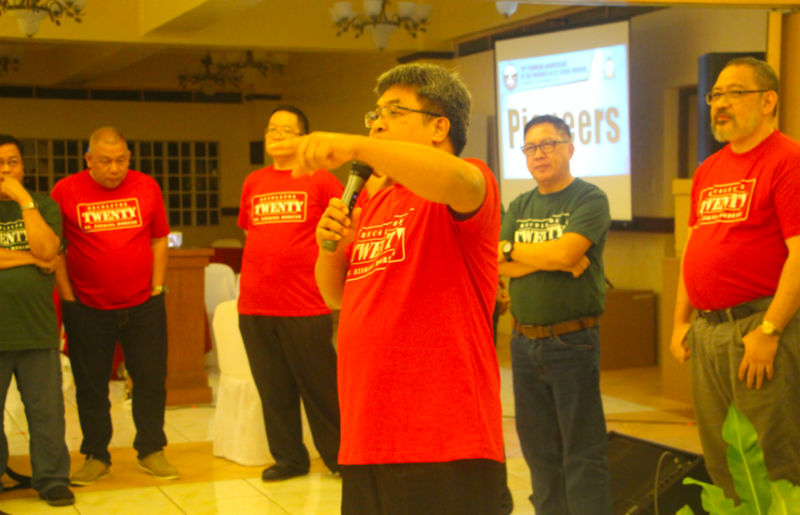 “Pioneers” refer to the group first produced (hence, “made in the Philippines”) by the Recoletos Formation Center since it catered to the novitiate and theologate programs of formation in 1985. Though it was nearing 11 o’clock in the evening, the stars continued to shine more intensely with the testimonies and snippets of wisdom issuing from those Filipino trailblazers while the younger ones listened to them attentively.